Steinvor Stienthorsson Makes a name for himself in Ireland! Not one week out from the British coast, Steinvor (whose forces glow a faint blue) spotted his adversary. He had word from Ireland that the Irish warlord Cahan Swedeslayer (whose forces glow a faint red) was making trouble in his father's holdings in northern Ireland. Determined not to let his father's name be trampled while Steinthor was off in Denmark battling for his brother ( See the Steinthor Captured! battle report to see how Steinthor fared in Denmark ), Steinvor martialled his karls and ships and set sail for the lands threatened by Cahan Swedeslayer. He would prove his worth or die in the attempt! And so, spying the town that right then was being ransacked by Cahan's horde, Steinvor made his plan. A daring inspiration over took him, and he decided he would land and form up two thirds of his army on a hill down the coast from the town. Challenges would be called so that the Irish would form up their lines. Once the Irish were formed up, the remainder of Steinvor's army would land in their longships behind the Irish battle lines. Steinvor trusted that his karls would hold the Irish in place while he marched the main force in to crush the hordes of Cahan Swedeslayer! A third of Steinvor's karls land behind Irish lines to devastating effect! Steinvor's plan came together beautifully as he surveyed the battle that raged behind the Irish lines. His karls had landed and indeed sent the Irish into disarry. The light warriors of the Irish auxiliary stood no ground to the onslaught of the viking karls. Two elements were destroyed within half an hour of the ourset of the battle. To Cahan, the battle was not going well. However, Steinvor's karls did not go unopposed. 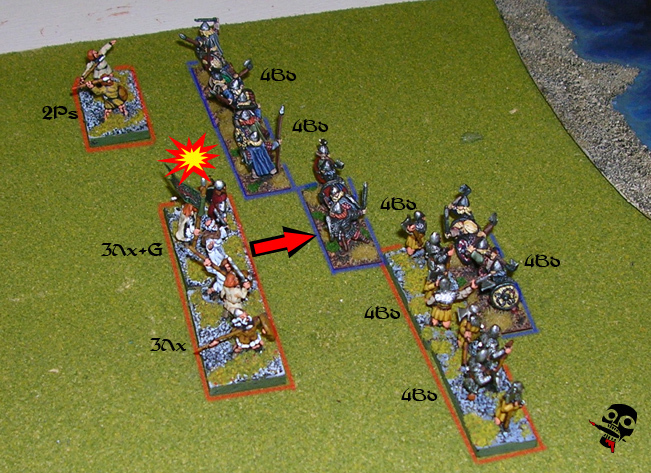 Cahan had his own karls (4Bd) to throw against the vikings, holding part of their line back. Cahan himself joins the battle agianst Steinvor's karls. Steinvor's main line continued to move up the field of battle, hoping to gain the fighting before the battle was finished. During the march, Steinvor's berzerks were caught out by some of Cahan's skirmishers, causing them to break and disperse to the winds and forests of Ireland, leaving Steinvor's horde one element down. Meanwhile, the battle behind Cahan's lines continued to rage. Cahan himself met the viking advance and managed to hold but not destroy the advancing viking line. Also, Cahan's karls continued to hold one element of Steinvor's vikings, threatening to swarm and destroy them as the battle drew on. Despite this resistence, the Steinvor's vikings destroyed another element of Cahan's army, leaving the current score at 3-1 for Steinvor. Only a single element and Cahan's army would crumble! Steinvor's karls are caught and trapped! Steinvor's karls survive the onslaught!! And so it was that among Steinvor's karls was a native Irish warrior. An Irish warrior who had long ago gave his allegiance to Steinvor and his father Steinthor! It was this Irish Warrior, Kelsey of Linster that saved his fellow karls from destruction! During the fighting, he called out in the native language of the Irish that their death was near, and that Morrigan herself was now watching from the skies to carry them to their deaths! 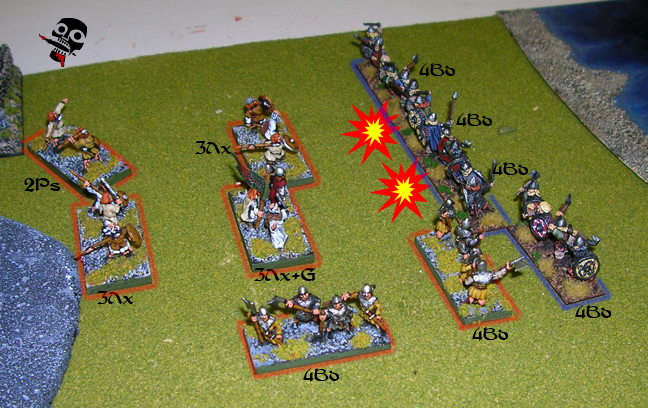 The Irish fighting lulled, and the karls of Steinvor were able to push them back! The battle still stood on the brink at a score of 3-3. 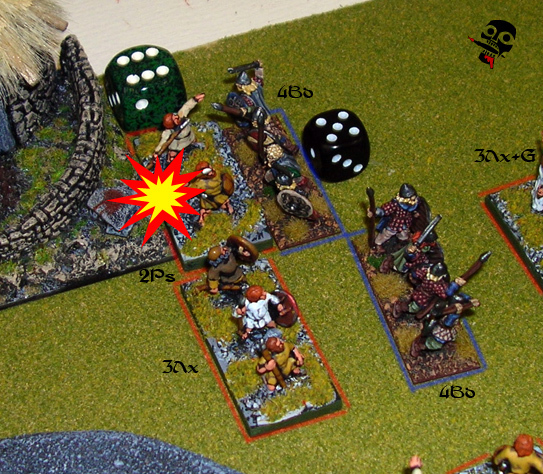 Bolstered by the success of their fellow karls, Steinvor's karls battling Cahan's skirmishers pressed them viciously. 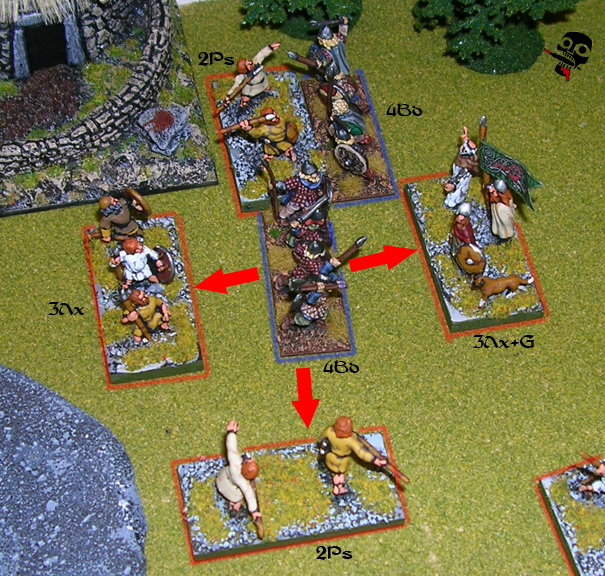 Forced to withdraw, the Irish skirmishers turned to retreat, but found their camp at their backs. 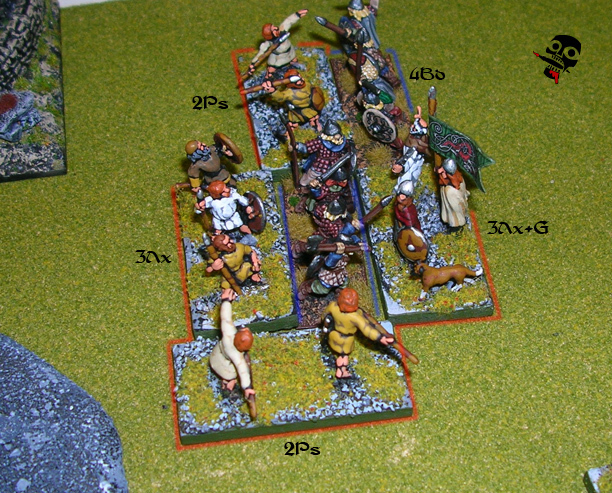 Realizing that they could be driven back no further, the Irish skirmishers broke and fled! With their last lost, the horde of Cahan the Swedeslayer was repulsed from the lands of Steinthor in Ireland. Steinvor issued a promise that if Cahan so much as showed his face in Steinthor's lands again, his head would decorate a spear while his body fed the crows! What an exciting battle this one was. I hadn't ever attempted a littoral landing (some armies in DBA are allowed to land up to a third of there army anywhere along the 'coast' in their first turn), and I thought I would give it a try. This especially because I played this battle after Steinthor had been captured, and so I was feeling a little reckless! It worked out, despite overwhelming odds against me though, and it harkens back to another battle (Battle of Snayfwickby) faught against the same opponent (well, one of the opponents), that had a similar outcome to a hopeless battle that also precipitated a viking victory! It seems that some of my vikings have the blessing of Thor! Anyway, it was a great battle, thanks to Spanikopites from Fanaticus for the fun time!